Michelle Lesniak received an Honorable Mention Award for a paper she presented at the 2017 Sigma Tau Delta Convention. Her essay, written for Professor Mindi McMann, was entitled “Boyhood Bonds and the Privilege of Mobility,” and was presented at the “Men of the World” session which focused on world literature and constructions of masculine identity. The recognition came with $100 to help defray her conference expenses. Michelle is currently in the 5-yr MA program. 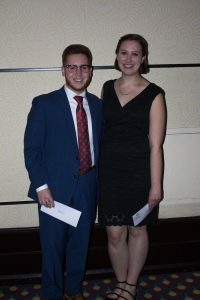 Michelle Lesniak and James McAteer, an undergraduate English major, accepting their awards at the Sigma Tau Della Convention.